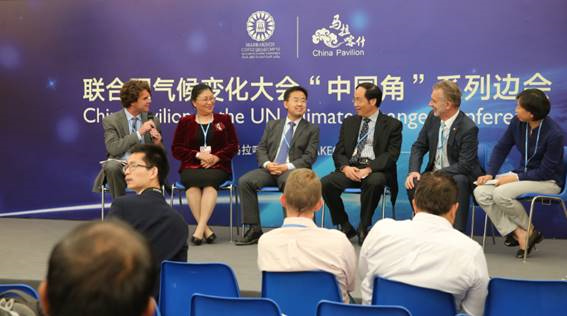 November 9, China Pavilion at the UN Climate Change in Marrakech kicks off its first side event. The event with the theme of “Ecological Management Improves Human Well-being”, is co-organized by Department of Climate Change of China's National Development and Reform Commission (NDRC) and China Green Carbon Foundation (CGCF), attracting nearly one hundred representatives from international organizations and more than 20 countries including America, Britain, France, Germany, Russia, Norway, Malawi, Colombia, Mexico, Spain, Ukraine, Indonesia, China and Morocco. Speakers at home and abroad, focusing on the core theme of “Ecological Management Improves Human Well-being”, talk about taking pragmatic measures such as policy guidance, mechanism innovation, scientific research, public education, community participation to mobilize and guide various social forces, actively participate regional ecological management, and strive to achieve the harmonious coexistence between man and nature. The side event is presided over by Li Nuyun, Deputy Director of Climate Office, State Forestry Administration and Executive Vice President of CGCF and John O'Neill from the University of California, San Diego. Xie Ji, Director-General of Department of Climate Change, NDRC, points out in his opening remarks: the Chinese government pays high attention to the construction of ecological civilization and issues the Intended Nationally Determined Contribution (INDC) to cope with climate change. In the next ten years, the goal of China’s INDC is to peak its carbon dioxide emissions around 2030, reduce the carbon dioxide emissions per unit of GDP by 60 to 65 percent below 2005 levels, increase its share of non-fossil fuels in primary energy consumption to around 20 percent and increase its forest stock volume by around 4.5 billion cubic meters from 2005 levels. As the basis of the ecological civilization construction, forestry has made a positive contribution to mitigating global climate change and creating human good life. 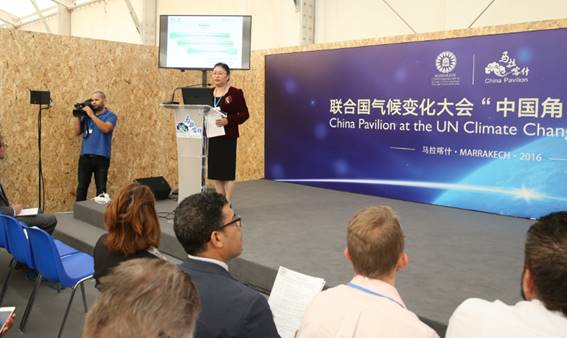 Today, focusing on the theme of Ecological Management Improves Human Well-being, the first side event shows the international community the achievements and experience of China’s ecological civilization construction, green development and forestry responses to climate change. With the theme of Chinese Forestry Tackles Climate Change and Improves Human Well-being, Mr. Li Nuyun states that the simultaneous development of government support and civil voluntary tree-planting is the important measure to increase China’s forest vegetation steadily. Only in 2015, China had achieved more than 5 million hectares of forest plantation and forest tending respectively; 500 million people voluntarily planted 2.3 billion trees; and the forestry output value reached 4.8 trillion RMB yuan. Forestry has made a great contribution to improving the well-being of the people. CGCF proposes a series of innovation measures such as establishing a platform of donation and voluntary emission reduction for enterprises and the public, carrying out carbon sequestration afforestation and developing the “China Certified Emissions Reductions (CCER)” forestry carbon sequestration trade project, which providing experience and examples for the promotion of eco-product trading and the achievement of “Green hills and clear waters are gold and silver mines”. Dr. Hans Friederich, Director-General of International Network for Bamboo and Rattan (INBAR) and Dr. Grace Wong from the Center for International Forestry Research share cases on bamboo carbon sink responses to climate change and deforestation prevention & reduction of greenhouse gas emissions respectively. Dr. Grace Wong highlights the experience of REDD+ developed in the Southeast Asia region and the key points need to grasp. 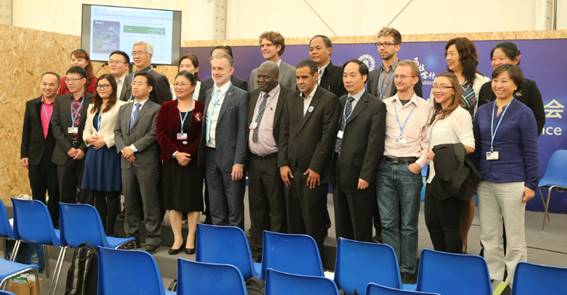 Dr. Hans proposes that the development of bamboo carbon sink and its access to the trading system is a crucial way to further enhance the economic and ecological value of bamboo, and in the future the three key areas including Africa, South America and Asia will carry out bamboo cultivation and promote the development of bamboo industry and relevant capacity building. Experts and scholars from the Department of International Cooperation of the State Forestry Administration, China Wildlife Conservation Association, Beijing Municipal Bureau of Landscape and Forestry, Zhejiang A&F University, China Hangzhou Low Carbon Science & Technology Museum, Shanghai Andersen Paradise, China National Sand Control and Desert Industry Society, Beijing Ingenuity for Travel Planning and Design Institute and other units carry out wonderful cases sharing on forestry policies and actions to address climate change, wildlife protection, bamboo carbon sink and the development of bamboo industry, green and low-carbon development education for the youth, low-carbon innovation in tourist attractions and other contents. In-depth exchanges and discussion are made between the speakers and the representatives participating in the event.